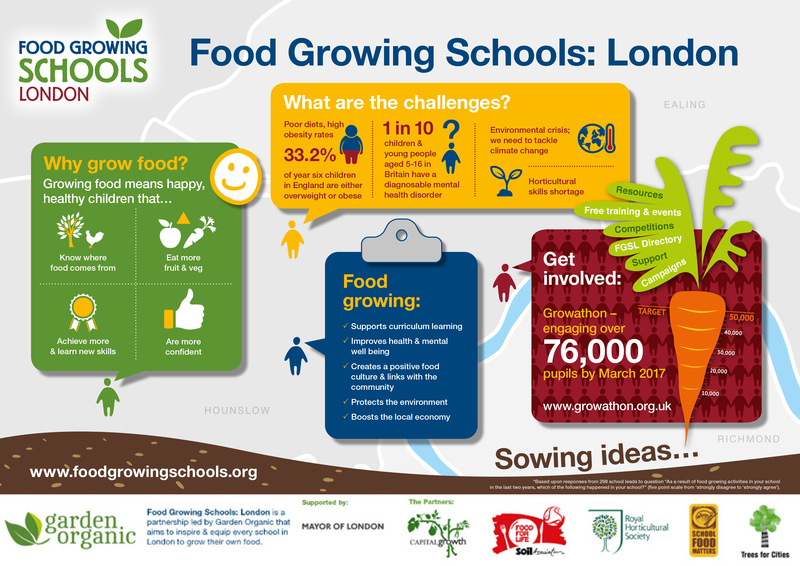 Local authorities across London and the UK are supporting food growing in schools in many different ways. 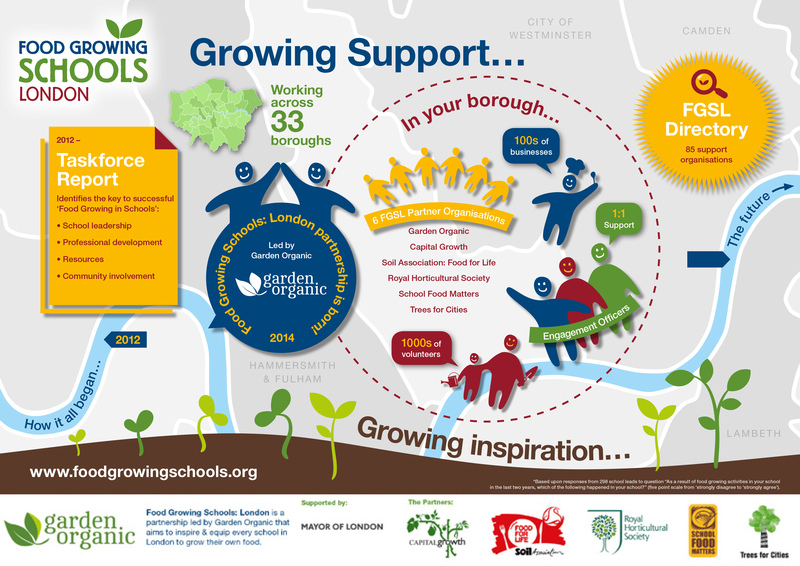 See why and how school food growing can benefit your borough. Please use the following tools to help promote food growing in your borough. Contact Adam Wright, FGSL Communications Executive, to get support and to find out how your borough is doing based on our research: email awright@gardenorganic.org.uk or call 0747 421 0703. Consult with local people, community groups, businesses and social landlords about food growing ideas and encourage them to work with their local schools. 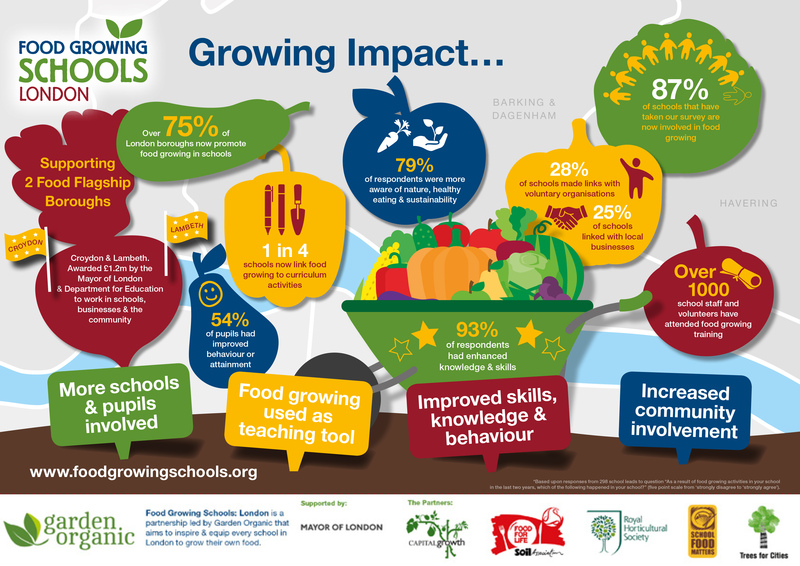 Our research shows that incorporating food growing into whole school activities, across curriculum subjects, and with local community support has a significant impact on health, the economy, education, community cohesion and the environment, for all. 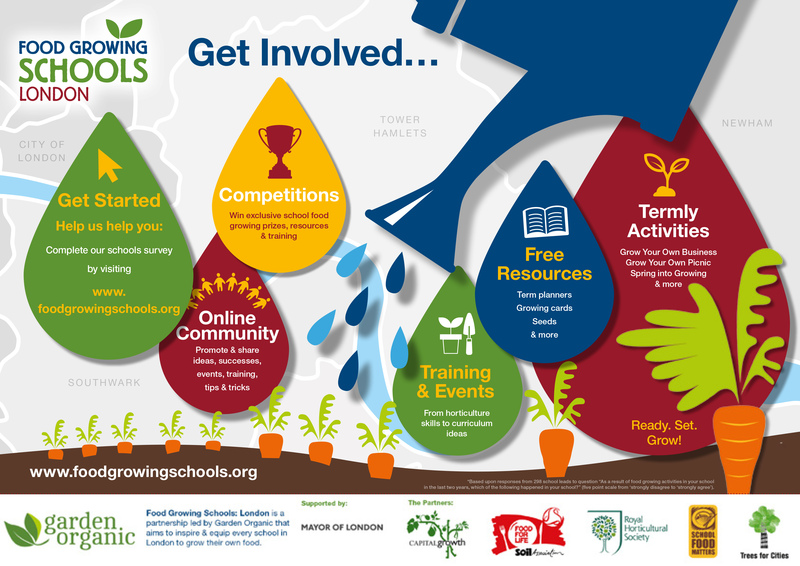 Read how the Tri-borough (City of Westminster, the London Borough of Hammersmith and Fulham and Royal Borough of Kensington and Chelsea) have come together to help encourage food growing through the Healthy Schools London programme. The Good Food for London report measures progress and encourages London councils to take action on good food. It measures action on 11 different good food measures including food growing and school food. The league table scores range from 88 to 13 per cent. The partnership initially started by writing a strategy along with mapping the various strands of work already taking place. It was also important to bring together the right partners from within various Council departments, the NHS, education, food growing projects and representation from the newly formed ‘Incredible Edible Lambeth’. Lambeth Council’s initial journey into the world of food growing came through their Green Community Champions programme . In the first year more than 40 projects were set up, mainly down to the huge interest in food growing in the borough. This was helped by a pro-active Council officer who recognised the benefits of these projects and offered advice and support to local groups and colleagues. This gave rise to a new way of thinking when working with local people, providing a more supportive role rather than a leadership role. This resident-led approach to food growing projects has helped shape other Council agendas and is challenging Council officers to work more directly with local people in other areas of work. As projects developed and local people requested greater support it was decided to create the Lambeth Food Partnership with a launch in June 2012. Education - Provide education and learning initiatives both in formal and informal settings across the Borough to raise awareness of sustainable food issues. Networking - Provide networking opportunities to improve the connections between the various components of the food system, to share good learning and encourage partnership working. Policy - Ensure that all policies and strategies across the Borough, for example planning, economic development, support a sustainable food system in Lambeth. Food poverty / Access - Improve access to healthy affordable food for all residents. Land - Increase access to land for growing and other food related activities for residents and community groups. Culture/Behaviour change - Celebrate the cultural diversity of food in the Borough, encourage positive behaviour change to support health and wellbeing and provide opportunities for community engagement in food activities. Environmental sustainability - Promote food produced in ways which conserve and enhance the environment and contribute to a reduction in carbon emissions. Procurement - Introduce procurement policies within public institutions e.g. schools, hospitals which include sustainable and nutritious food, and which support animal welfare and fair-trade. Local economy - Encourage the development of a vibrant local food economy, support food related SMEs and local food growing initiatives.